2Wycked: I highly recommend you watch the embedded video first before I summarize the short film. It truly is a beautiful piece of cinematography. “An Occurrence At Owl Creek Bridge,” aired by the Twilight Zone in its final season, was a French short film produced and released in 1962, winning awards for best short film at the Cannes Film Festival and the Academy Awards. It is based off a popular, but often forgotten gem of a short story by Ambrose Bierce. As the episode opens, we are greeted with a Civil War sign stating that any civilian caught interfering with railroad bridges will be summarily hanged. 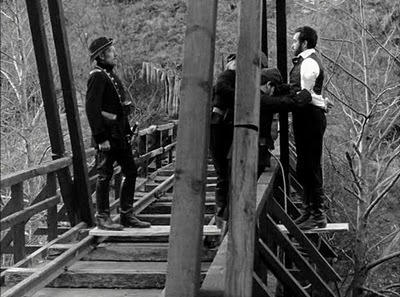 The steady staccato of drums is heard—admist the chattering of birds and local fauna—as a man (Peyton Farquhar) is lead by Union soldiers across a bridge onto a plank. It is clear that Peyton is about to be executed. He is solemn but apprehensive as a soldier lashes up the rope that will serve as his death. Peyton becomes increasingly more distraught as he sees the line of soldiers prepared to watch his hanging and his view of the peaceful, meandering river beneath his bound feet. Moments before the hanging, he closes his eyes and envisions his house and kids, as his wife moves to embrace him. As the plank is withdrawn and he seemingly plunges to his death, the rope snaps and he shoots straight into the river. He undoes his feet and arm bindings quickly and rises to the surface. Once there, he notices he has a strange sensibility to the minutiae of the flora and fauna around him; for example, he notices and appreciates a spider delicately spinning its web. Peyton quickly becomes aware the Union soldiers are organizing to rifle him down in the river. He stares down the barrel of one rifle before haphazardly tossing about in the river, desperately swimming away from the gunfire. Bullets richocet off the surfaces and water around him as he finds his way through the increasingly churning waves to a small bit of shore. Once on this peaceful spot of sand, Peyton celebrates his miraculously improbable escape with the giddy zeal only a man faced with the crushing weight of his impending death can understand. Once collecting himself, he races through grassy fields and around overgrown shrubs towards his home. After some time, he collapses on the bark of a big tree, his bloodied hands weak and tired. Despite this, he ventures on, finally reaching the spell of trees that leads to the iron-wrought gates of his home. Peyton passes through the gates, slowly but with the plodding assurance that the most taxing period of his life has lead him back to the refuge of his soul: his family. His wife—clad in a luxurious dress—descends the steps of their gorgeous home, beaming at him. He begins to run towards her, his hungry, grateful arms extended at full length. They do meet, with her hands embracing Peyton’s face as tears stream her own. Just as they lean in to kiss, his neck jerks back violently, as the noose breaks his neck. 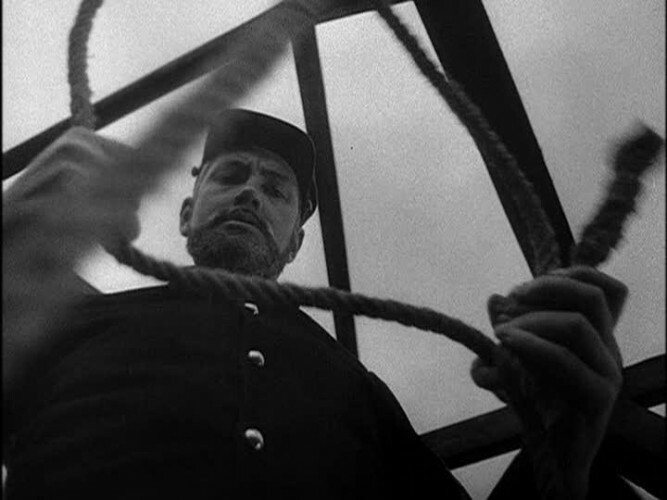 In a startling turn of events, we realize that the rope never broke free at all, only snapping his neck. Peyton’s heartbreaking journey home was just a myth, a fleeting wisp of fantasy inside the mind of a man facing his own mortality. His mental race home to his loved ones was simply the dying fancy of a man seeking love inside a cold, loveless world. An occurrence at Owl Creek Bridge – in two forms, as it was dreamed, and as it was lived and died. This is the stuff of fantasy, the thread of imagination…the ingredients of the Twilight Zone. First off, the quality of this episode must be noted. The acting was superb, the pacing was excellent and the shots were well done. Based off the short story, the short did everything it needed to do to portray the quiet yearnings of a man whose heart hungered for the love and curiosity for life that death cuts short. The twist at the end is executed with brilliance. 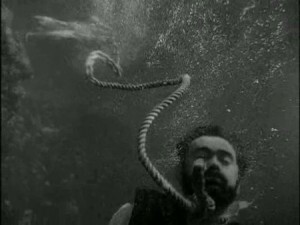 The episode leaves the viewer with the haunting sense of loss that Peyton himself must have felt before he plunged to his death. The supernatural elements of this episode and the heart-wrenching twist certainly place this short in the auspices of the Twilight Zone. However, the apolitical nature of the episode combined with the lack of a moral, philosophical, or psychological element or angle is most striking. This episode cannot be boiled down to a “war is hell” angle or “the inherent unethicality of capital punishment.” This episode defies categorization unless you draw the very simple—but often overlooked angle—that life is inherently beautiful. This episode is simply about a civilian who is put to death for his Confederate political sympathies that lead him to violate a Union order about harming railroads. It isn’t about American politics, geographical chauvinism, or the morality of capital punishment during wartime: it is about one man facing his death and his desire for life and love in a world that is all too often devoid of either. Peyton—as he walks the gallows—has visions of life that reflect two key concepts that make life beautiful: curiosity and love. As he arises from the waters of the river, he immediately is cognizant of the flora and fauna around him. He is aware of the songs of the birds around him and the natural ambiance of the forest. His acute awareness—combined with his acknowledgement of the spider spinning its web—represents his recognition of the curiosity that is the world. Curiosity for the world is a key component for understand the beauty that is life. It might be a child toying with a fork in an electrical outlet; it might be an adult test driving cars at a local dealership, but what curiosity represents is an invigorating interest in the world around you. Curiosity takes on a number of forms that approach the infinite in the human experience, but it represents the devotion to discerning and explaining the world around you. Still, this fascination with the world can only be pieced together and held tight by love. Fascination with the world around you isn’t sufficient for appreciating the beauty this world has to offer: only when it is fused hand-in-hand with love can it be fully understood. A man isn’t a rock nor an isolated island, he is surrounded by multitudes of others who—like him—are eager to understand the world and find their place in it. In this episode, Peyton is presented with the wondrous experience of perception that piques his curiosity. Yet, what makes all this curious perception worthwhile is his family. This love for his family causes him to tear through miles upon miles of wooded lands in search of them. His interest in the world around him not just speaks to his existence as a man, but also to the love for his family that speaks to his reason for existing. It is tough to see this at the ending of this episode, but the lesson is that life is beautiful. Not that it is short, not that is brutish, but that if you simply take the time to acknowledge the world the around you (curiosity) and appreciate for what it is (love), you can appreciate the beauty that is life. Powerful short. But I find it hard to think life is beautiful, well modern life. Yes…..look harder as Single malt said……. And work yourself……use your skills, kindness, whatever you have to make it more beautiful for others. In that alone you can find plenty. The Twilight Zone was a great show, the stories had great pace and great lessons. This short film was also great just a last fleeting dream of what can be or what a man wishes to be. Thank You. Saw this short film in high school English class and loved it then. Thanks for sharing your thoughts, and I’ll have to revisit it now that I’m older and a sad and wiser man. Funny — they showed it to us in junior high school. Might have also been English class. The kids were really spooked at the ending, I remember that. I saw this episode at my grandparents’ house when I was a little boy. Thank you for reminding me of it and letting me see it again. I love your interpretation. Thank you for your insight. A lot of good lessons in The Twilight Zone an The Outer Limits, used to love watching them when they were on here. That was interesting. I kind of enjoy it when ROK has “video analysis” articles. I never got to see much of The Twilight Zone, but, if the vast majority are as good as that, I might start watching more of it when I get the chance. Also, just going to be a crazy for this, but 2Wycked is the name of Carl’s car in ‘Aqua Teen Hunger Force’. I don’t know why that came to mind just this second, but it did. Once again validating that RoK is nothing but hateful misogyny. Beautiful analysis. Thank you. Wonderful post. And, on this note, let’s please not forget the Android’s final monologue in Blade Runner. If you have Netflix, and if you haven’t watched it already; you guys should go watch “Black Mirror”; it’s a modern-day British that has a similar “get-you-thinking-at-the-end feeling that the Twilight Zone puts out. Remember that Twilight Zone ep when Belgium made a morbidly obese woman the minister of health? Oh wait, its fact not fiction! Why not hand the baton to jean claude van damme? His schedule is wide open these days, he’d be a better choice than a 300 lb woman. Yes, I remember seeing this as a kid (and in school, something they still could do in the early 80s), and just watched it with my kids the other night. It has a corollary song (“Green Green Grass of Home”, sung famously by the Statler Brothers) which has the same theme. Great stuff. Do kids even get this kind of stuff any more in school? As far as reading assignments? Or is it all black and feminist studies? The twist at the end has been ripped off so many times that you’re expecting it to feel hackneyed and cliched but you quickly realize just how powerful the original is. I read the Bierce short story in high school. One of the most haunting stories I have ever encountered. Saw the short film some time later; it didn’t have the power of the written version, for me. This is a very good article. There should be more of this and less of the other stuff. Nice article. I read this in 9th grade and it remains one of my favorite short stories of all time (along with Water Mitty). This is an incredibly thoughtful, insightful, and beautiful analysis of one of the best short films ever made. Thank you for writing it, though this comment is clearly late to the game.